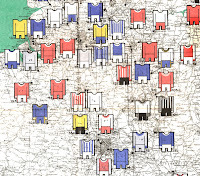 As football memorabilia goes, it's not often you stumble upon something as functional as a map, but back in 1971 John Bartholomew & Son filled that particular gap in the market to great effect. If you were lucky enough to be both a serious football fan and a car owner in the early 1970's, you'd have probably spent many a Friday evening poring over a huge map like this to work out how to get to the away ground of your choice. All well and good, except an ordinary map didn't really add anything to the match-day experience by virtue of it being… well… just a map. Bartholomew's, however, saw the potential to add a much needed splash of colour and excitement to the proceedings. With this foldable 100 x 80 centimetre sheet, it was possible not only to plan your route by road but also become acquainted with much of the vibrant imagery the game provides. The bulk of the map was taken up by the outline of England and Wales filled with the markings of a million and one highways and motorways. 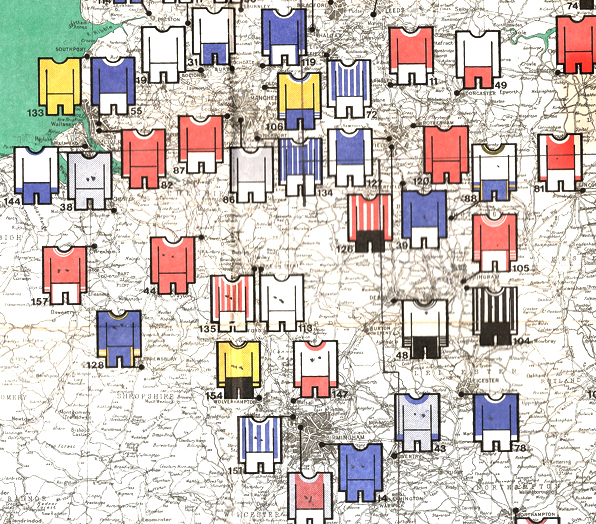 Overlaid onto that were simple, angular illustrations of all 92 Football League clubs in kit form, joined by lines and dots to the exact location of their home stadium. This was a fine way to underline the footballing subject matter, however to be reluctantly honest for a moment, they did rather obscure the map itself. Maybe the map was never intended to be used in anger anyway, such was the tiny detail that was printed upon it. This was borne out by the inclusion of this map's finest feature in my view – a top to bottom column showing the club crests of not only the league clubs of England and Wales but also many non-league clubs too. Here we get a rare glimpse at so many of the graphic devices used by teams some forty years ago or more. 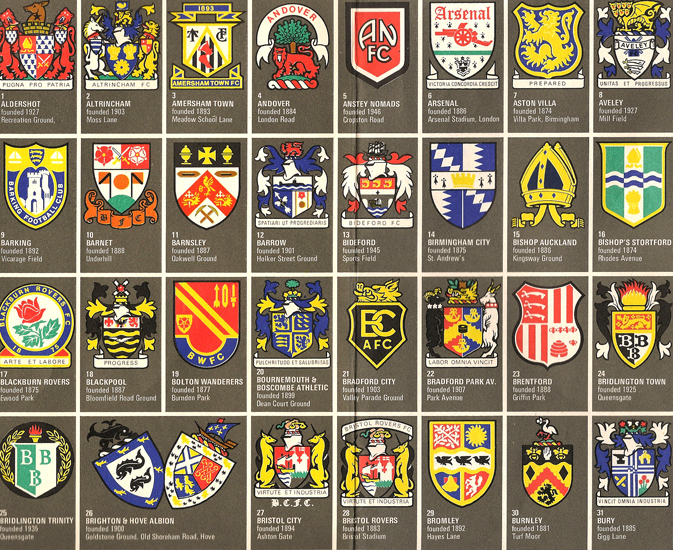 It's easy to think that many of the club badges we see today have been around seemingly forever, but this map gloriously dispels that theory once and for all. A casual glance throughout this parade of 160 miniature works of art reveals some forgotten classics. 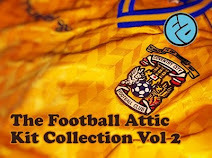 For a start, there's Aston Villa – a club not unused to changing their badge in recent years – here represented by a squat yellow shield filled almost completely with a lion of the same colour. Then there's Birmingham City, another team using the shield motif, but this time quartered in a bizarre zig-zag fashion prior to the introduction of the double-globe we know today. Norwich City: Come on you Reds? 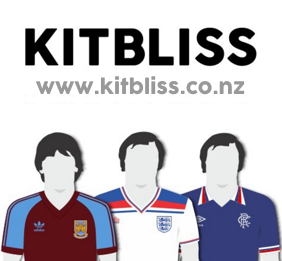 You may not be a fan of Bolton Wanderers' 'balloon' badge of the present day, but once upon a time there's was a round-ended shield coloured in red, yellow and blue – hard to imagine nowadays. Crystal Palace's badge, however, seems to have fallen through the cracks of time. Rarely seen, this is a beautifully designed shield labelled with the letters 'CP' while on top sits a simple depiction of the Crystal Palace building. 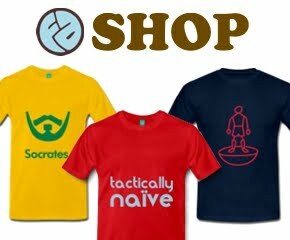 Another team suffering from colour crisis is Norwich City. Their badge (featuring heraldic lion and fortress) was mainly red and yellow. Back in 1971, they wore yellow shirts and black shorts with only the merest hint of green around the collar and cuffs. Having changed to yellow and green shortly after, it was perhaps obvious that the Canary motif would eventually replace the badge shown here. Crests, shields and historical imagery were very much the order of the day back then, but perhaps the final word should go to the teams desperate to strive towards a more modern logo. Step forward Skelmersdale United, owners of a beautifully simple badge for its day, and Telford United, happy to adopt a basic compass point arrowing towards a football for its own graphical purposes. With the tokenistic addition of a potted history of Football in England and Wales at the bottom, you have the perfect example of nostalgic design over function: in essence, a map that can't easily be used as a map. Hang it on your wall, however, and you've got yourself an absolute masterpiece. To save a bigger version of all the badges shown, left-click on the image above right, then right-click and choose 'Save image as...' to store the full-size graphic on your computer. 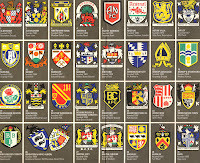 Rivals the Esso Football Club Badge collection of the same year which also bizarrely featured some relatively obscure teams (Barrow, Workington). 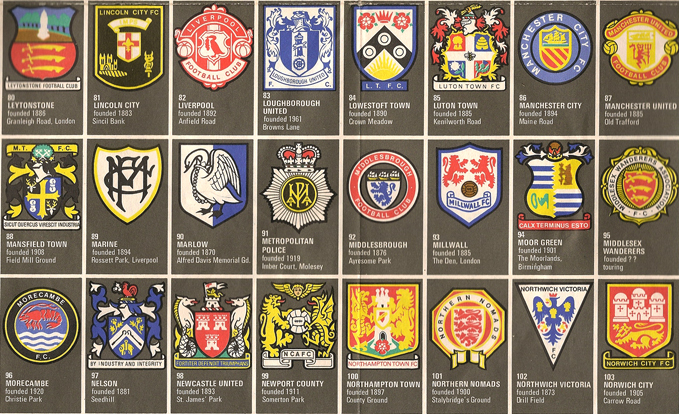 Some of those old badges were works of art which swiftly gave way to 1970s angular minimalism. Of course today the club badges are so heavily copyright protected not even the former Rothmans yearbook is allowed to print them. 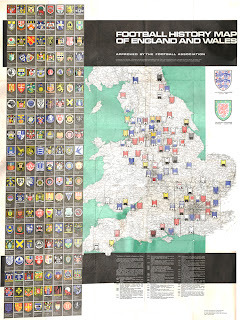 I've got one of these excellent maps- was my dad's who was an avid spurs fan. I did have it up on the wall for some time but I was worried about it getting damaged (by unruly kids who don't appreciate football) so it is safely rolled up in a cupboard at the moment. I have one for sale.... perfect condition, Guinness limited edition. Oh and thanks for confirming this from somewhere in the back of my mind from being a kid in the 70s. There used to be one at my grandparents' place.